Having completed my "variometer" I went back to my original predictions, introduced political party affiliation of candidates (for whatever worth they are inside the MUD) and built up this new half moon chart of what the next National Assembly could look like. That is, I am ruthlessly following my numbers even if some of them should in my opinion be different. Remember also that polls are not good and are confirming my negative calculations. My electoral prediction variometer is ready! But I will not make it freely available, you will need to write me to get the Excel sheet if you want. Courtesy of another long time reader who appreciated that I published my negative thoughts before the vote, even if risking to discourage a few people, I got inspired to write up already the post-mortem of the opposition. In spite of all my pessimism I will go out and vote. As such I do not share an iota with such people that do not want to go and vote because they consider the voting act a farce AND YET NEVER OFFER A CREDIBLE ALTERNATIVE PLAN. And do not forget one thing: if we do not know how many votes our side did gain in the end, Chavez does know and that will painfully gnaw at him. Warning: major cynical and overly long text/rant follows. Read at you own peril. If your Spanish is OK, do not miss "Estar Cuar" at the Chigüire Bipolar!!!! Well, it is time to make a final prediction, and I am afraid that most readers of this blog will not like it. And I may add that never was I so keen to be proven wrong. 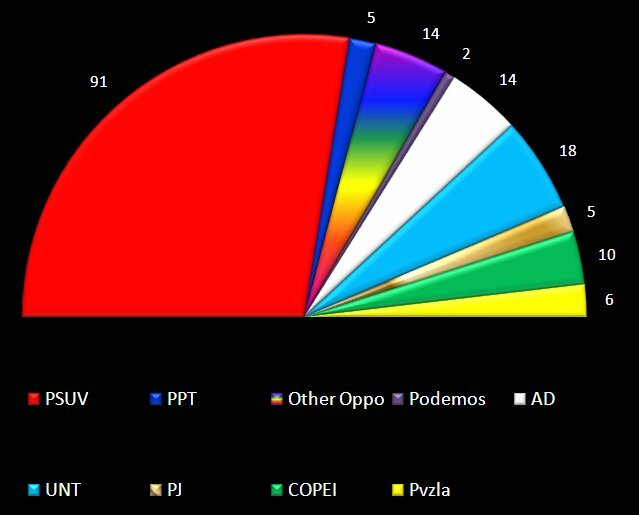 In the figure above in red we have the number of seats the PSUV and allies will take and in blue what the Opposition will take. How did I reach this? We must be winning 'cause zombies are emerging! After the series of posts on electoral analysis this is my prediction for the composition of the next National Assembly, as a summary of all of these posts. NOTE: they were written in an early August perspective and today I would already change a few things but that will have to wait a few days for a new post on the matter. The final assembly, maybe? Situation August 2010. When I started this project I did not know if I was going to have enough time to finish it. Thus originally I had planned to leave for the end Bolivar and the Llanos, the regions that I know less about, hoping that in case I lacked time the rest of the discussion would be enough to give a good idea of the September 26 election result. But as I plodded my way through I realized that the election will be decided in the two states of Aragua and Carabobo, the industrial heartland of the country, and thus found the motivation to write it all and leave that discussion for the end. With 18 seats these two states represent 11% of the representatives to be elected in the new assembly. If everywhere else in the country results can be guessed more or less accurately, in these two states it is where we are more likely to find interesting and significant shifts. That is, Zulia is for the opposition: that the PSUV gains 1 or 3 seats really does not affect much the overall picture. Same story in the Llanos where the PSUV is going to win and where the opposition gains will not be enough to imperil a putative chavista majority. But in Carabobo, through gerrymandering, the opposition is not certain at all to fulfill its potential and in Aragua, the chavista bastion will still be carried by the PSUV but will be quite damaged. For the opposition to win the National Assembly it is a must that it resists the gerrymandering of Carabobo AND that it breaches the PSUV monopoly in Aragua, and for chavismo it is essential that the Aragua hegemony is preserved and that the opposition does not reach half of the Carabobo seats otherwise its majority will be too thin for comfort. Who does Weil has in mind? Chavismo electoral campaigns are not what they used to be. This picture in Tal Cual tells us how distant the president is getting and how sloppy his staff is getting. Luis Tascon murió. William Lara murió. Guillermo Garcia Ponce murió. ¿Que los une ademas de su lealtad a Chavez? Luis Tascon died. William Lara died. Guillermo Garcia Ponce died. What is common among them besides their loyalty to Chavez? 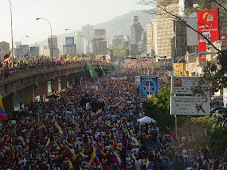 Oriente, the North Eastern part of Venezuela, used to be Accion Democratica land. As such it had no problem to become chavista land within a few years. In 2008 chavismo took everything but the small island of Margarita, a sweep that left me quite surprised. After all, we are not talking here of a region with particular affinities for a Llanero president: people of Oriente are a little bit different than the rest of the country, speak faster, swallow the ending of many of their words and look at Caracas like some alien city. Since the Monagas brothers, if memory serves me well, the 4 states of Oriente have only given Venezuela one president, Lusinchi, in 1983-1988. Their last attempt was the disastrous candidacy of Alfaro Ucero from Monagas that did so much to bring Chavez to power. That does not mean Oriente has not participated in Venezuela history: it has its shares of heroes, ministers, writers and artists. But perhaps there is some lingering effect that the Spanish province of Nueva Andalucia was attached quite late in the XVII century to Caracas and Orientales like to stay among themselves. I am rather busy these days, among other things fighting back an extortion attempt from government employees who need to fulfill a quota of extortion so they can finance the PSUV campaign (and line up their pockets along the way). Details do not matter because were I to go to a court of justice my options would range from nothing happening to me be thrown in jail, never the bureaucrat. Let me put it this way, on some technicalities the bureaucrats involved want me to give them the amount of the fine, not letting me pay it to the state as it should be. That is, they can delay the legal solution of my problem forever, even if I am willing to pay the legal dues, unless I pay these to them and then they sign up all the paper work in a jiffy. Needless to say that this "incident" is giving me a particularly clear, raw look into why Venezuela economic recovery is not going to happen anytime soon. There are three states in Venezuela that really cannot be fit together except that their daily life is based around the mood of the Orinoco river of impressive water flow. Being able to sail it is pretty much what decides the everyday life of its people. Until the 60ies there was no bridge to cross it. President Raul Leoni opened the first one at Ciudad Bolivar. Since then a second bridge for Puerto Ordaz finally opened after much delay by Chavez (though apparently it is still not quite complete). Chavez in great fanfare started work on a third bridge at Caicara and that was that, amen of the justification for a bridge where local traffic can be managed quite well with ferry. But that is OK for Chavez because every so often he goes back there to pretend work is speedily advancing. The natives are not holding their breath until completion. ¿Quien mató a Franklin Brito? Creo que es justo que empecemos a hacernos esta pregunta ya que Franklin Brito quien murió de huelga de hambre, finalmente descansa en su lugar de nacimiento. Usted puede leer el editorial del Tal Cual de ayer, por una vez en lectura gratuita por su importancia: ¿Quién mató a Brito? Teodoro Petkoff no puede dar nombres en su editorial, pero este blog si puede hacerlo. I think it is just that we start asking that question as Franklin Brito who died of hunger strike will finally be put to rest in the next hours in his birth place. You can read the editorial of Tal Cual today, put for once on free reading for all: ¿Quién mató a Brito? Since Teodoro Petkoff cannot name names in his editorial, this blog can. Yesterday Chavez was campaigning in Maracay, violating several rules of the electoral law. Among them is that a public official cannot campaign actively during the official campaign. Another one is that it is forbidden to use national symbols: Chavez does not drop anymore his Venezuelan flag jacket. There is a video you could see for that in this Minister of Communication page (they say it, they post it, it is not me making this up). It is not that Chavez says absolutely directly without a doubt that he will not recognize the result if September 26 if unfavorable to his side, but all the implications of his words, his attitude and his tone betray him exactly as his real sectarian nature was betrayed when he refused to send funds to the hospital Perez de Leon in Petare. "Ese es nuestro plan, aquí no está planteado acuerdo alguno con la burguesía traidora, con esta oposición apátrida" This is our plan [radicalizing the revolution], there is no plan whatsoever to reach an agreement with the treasonous bourgeoisie, with this fatherland-less (?) opposition. There you have it, the opposition can win whatever it wants to win, the revolution goes on.